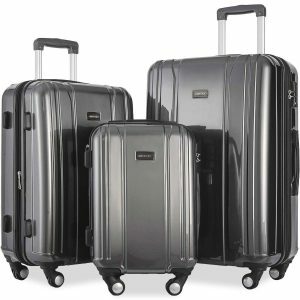 The Merax 3-Piece Luggage Set (PP037229) we’re reviewing on this page is one of their latest on the market and comes with a variety of user-friendly features including a TSA lock as well as a very sturdy hardshell case that is made of solid ABS plastic + PC- Polycarbonate materials. The customer rating is 4.8 out of 5 stars by a total of 15 customers’ reviews and ratings. You have four nice and vibrant colors to select from, including coffee brown, dark grey, red and silver with small price differences. The three suitcases in the set are very nicely designed, constructed and solid for your frequent business and leisure travels. There is a protective film on each suitcase and you need to detach it before starting to use them. It needs to be done from the bottom and please refer to the instruction on the youtube video on https://youtu.be/OlaFCT0jEFI. And then you will see how glossy and pretty these suitcases look. 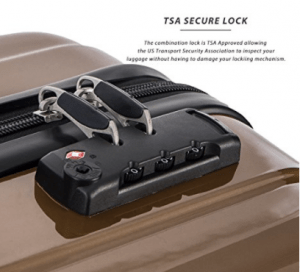 As part of this luggage set, you will get a large 28-inch suitcase for consignment and a medium 24-inch suitcase that needs to be checked in before your flight and the 20-inch carry-on bag that you can easily take on the plane and put in the overhead locker just above you. The smallest cabin bag weighs only 6 pounds and measures 22 x 14 x 9 inches including the wheels (20 x 14 x 9 inches without the wheels). The medium suitcase weighs only 8 pounds with the measurements of 26 x 17 x 10 inches (24 x 17 x 10 inches without the wheels). And the large suitcase weighs 9.5 pounds and measures 30 x 19 x 11 inches (28 x 19 x 11 inches without the wheels). For saving on storage space the three suitcases can be nested into each other and you will get them shipped this way via Amazon.com. Please note that you need to get these bags as a set as they are not available separately. The aluminum telescoping handles seem quite thick and sturdy and have a rather pro and ergonomic design and will help you roll your suitcases smoothly on their 360-degree rotating quiet spinner wheels any ground. These come with TSA-approved locks without keys and you’ll get the digits set to 0-0-0 and you can refer to another video on https://youtu.be/vwhvYBuyD3I on how to reset it. The ABS and PC material combination makes these suitcases both lightweight and solid. They are so robust and durable that the company gives you three years of warranty that is valid globally. They are reported to hold up very well on people’s different travels abroad through the airport terminals, flights, metro and train stations. According to customer reviews, there was no damage, they had no dramas and that the wheels rolled very smoothly. All three suitcases have the extra expandable capacity with the zippers in the middle and they become even more spacious inside. The rubbers on the telescoping, side and top handles feel quite comfy and make it easy to grip. You’ll find a liner that covers the telescoping handle inside each suitcase. You have the zipper compartments and pockets on both sides of the luggage for your smaller items like your socks and toiletries and cross straps on the right-hand side. The suitcases look very elegant and pretty both inside and out. Overall this is a very good value travel product at a very good price for what you’re getting.